John Olson visits the center named in his honor. 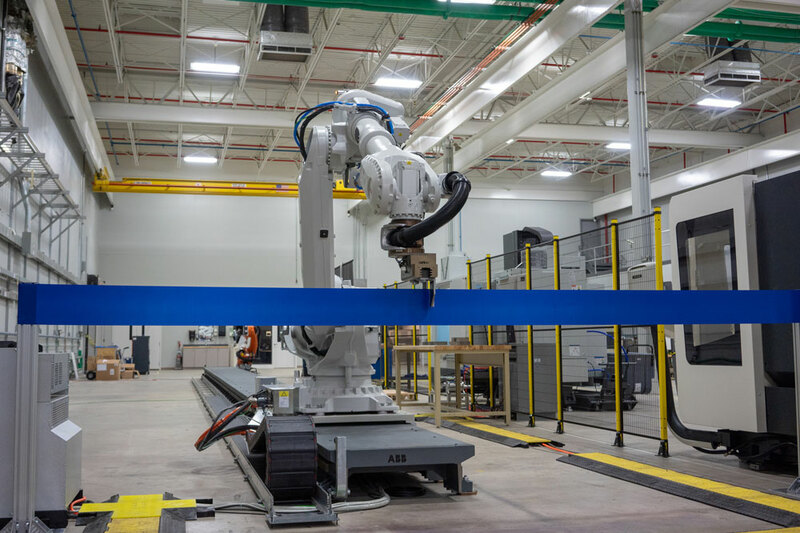 Even before a state-of-the-art robot cut the blue ribbon to officially open UNH’s new John Olson Advanced Manufacturing Center, the crowd gathered there was focused on the future. 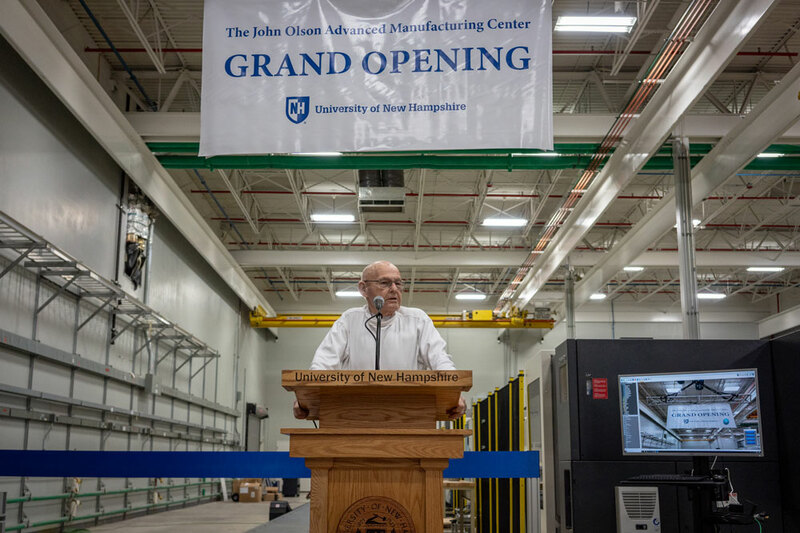 As UNH President Mark Huddleston aptly stated, however, this was also a day to honor UNH’s past — with a center named for a dedicated alumnus, John Olson ’57, and that center’s mission of training highly skilled workers for the manufacturing sector, right in keeping with UNH’s roots as the New Hampshire College of Agriculture and the Mechanic Arts. A robot prepares to cut the ribbon at the center's opening. The Olson Center is focused on advanced manufacturing technologies and has been designed to help provide skilled employees for New Hampshire’s — and the nation’s — manufacturing sector in such areas as high-­precision machining, light materials, flexible electronics and Industry 4.0. “We’re very, very excited. 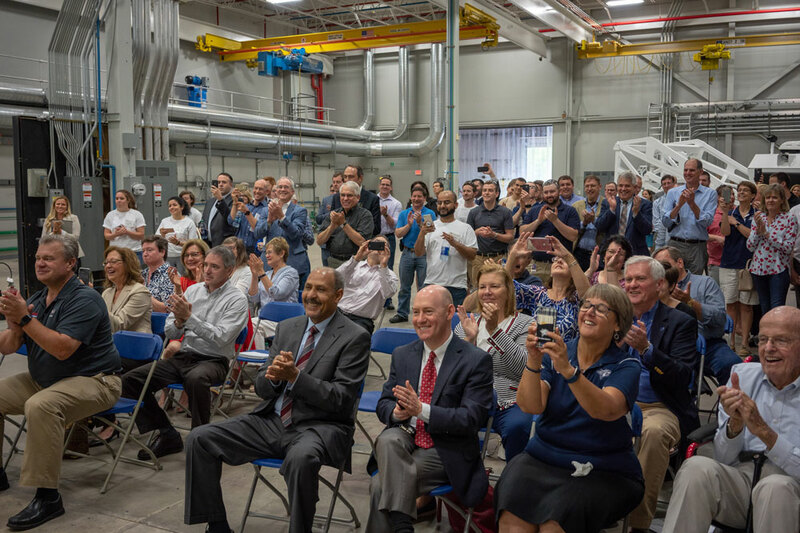 This is going to be a great opportunity to educate the next generation of the workforce,” Dean Bartles, director of the John Olson Advanced Manufacturing Center, told the dozens of alumni, students and university, state and federal officials who gathered at 121 Technology Drive for the center’s opening on June 1. Wayne Jones, interim provost and former dean of the College of Engineering and Physical Sciences (CEPS), discussed the importance of the hands-on experience students will gain there, citing the center’s evolution “from an idea to what is going to be a magnet for UNH and for New Hampshire as a whole." We have a great workforce in New Hampshire," he said, noting that even more skilled employees are needed in the future. "This is going to be a great opportunity for UNH for years to come," he said. Attendees react to the robot ribbon-cutting at The Olson Center. Following the ceremony, students gave tours of the center. Mike Locke ’18, who graduated from UNH just a few weeks ago, also spoke at the event as both a CEPS graduate and Bartles’ first full-time employee at the center. Interested in a career in manufacturing? See what UNH's College of Engineering and Physical Sciences has to offer.